Bad breath or halitosis can be a long-term nuisance, resulting in discomfort and embarrassment in social situations. Culprits of bad breath include poor oral hygiene, such as not brushing your teeth and infrequent brushing can contribute to dental plaques as well as periodontal diseases which in turn cause the formation of bacteria resulting in bad smell in your mouth. Various other factors such as eating spicy foods, poor hydration and a dry mouth condition, will give you bad odor. 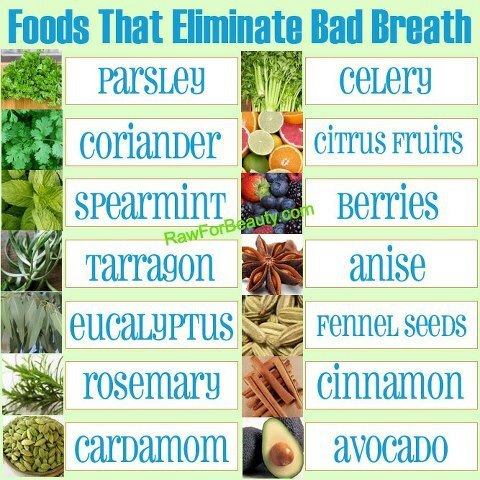 If your bad breath causes people to avoid you, consider natural ways to combat your problem. 1. Brush and floss: Brushing at least twice a day for two to three minutes at a time helps to eradicate bad smell producing bacteria living on your teeth and gums. And also floss your teeth at least once every day help to get rid of food particles stuck between your teeth and the gum line. Use a tongue scraper or a toothbrush that has a built-in tongue cleaner to remove bacteria on your tongue and stop bad-breath. Replace your brush every three or four months. 2. Salt water gargle: Mix salt and warm water in an 8-oz glass. Rinsing and gargling with salt water three to four times a day helps to clear the germs, mucus and other debris such as food particles from your mouth and throat, helping to eliminate bad breath. 3. Drink more water: Dehydration is one of the most common factors behind bad breath. Lots of people do not drink enough water during the day to ward off the bacteria within the mouth, which are most responsible for producing bad odor. But you must drink enough and fluoride-free water throughout the day to help produce enough bacteria-fighting saliva. Rinse out your mouth with water, which is generally good for your system. Consume more carrots, celery and apples: Crunchy fruits and vegetables which are full of dietary fiber are effective in combating with bad breath. These food types also help trigger an increased production of bacteria-fighting saliva into the mouth. Oranges, melons and berries: Most of these fruits are high in vitamin C. It is not only helpful for keeping bacteria in check, but also helps combat periodontal diseases as well as gingivitis, which may also lead to bad-breath. Remember that consuming higher levels of foods rich in vitamin C can cause teeth staining. So, make sure to consume in enough quantities. 5. Chew sugarless gum: Chewing the gums after a meal boost saliva flow and it helps to flush smelly bacteria out of the mouth. Garlic, onions, dairy products and vegetable like cabbage may cause bad breath. Chew cinnamon-flavored gums that help to combat bad breath. And also choose gums that contain xylitol, a sugar substitute that also helps prevent bacteria forming inside mouth. 6. Skip the cigarettes: Individuals who smoke cigarettes are more likely to experience oral infection and diseases. In addition, they often have a plaque build-up on their teeth and plaque is an ideal place to harbor odor-causing bacteria. 7. Baking soda: Baking soda is best way to clean your teeth and get fresh breath. It works by changing the pH level in mouth, thus restricting the development of germs inside the mouth. For fresher breath, brush your teeth with the baking soda. 8. Tea tree oil: Add a drop of tea tree oil to toothpaste before brushing which is an effective remedy for bad breath. You may also make a mouthwash with tea tree oil by adding 3 drops to a cup of warm water. Rinse and gargle this solution for two to three times every day after each meal, if at all possible. 9. Avocado: Avocado is another powerful remedy for bad breath as it helps to get rid of intestinal decomposition which can cause bad breath. Include avocados as part of your regular diet to keep bad breath away. It can also lower the risk of oral cancer. 11. Parsley: Parsley will be the king of natural breath fresheners. Parsley is full of chlorophyll, a green plant compound that kills bacteria that trigger bad-breath. Try to eat fresh parsley after a meal or any time your breath needs freshening. Swallowing the herb helps with digestion and reduces intestinal gas, can also stop bad smell. In the same way, Cinnamon and spearmint can help eliminate your bad breathe. 12. Black tea: Black tea helps keep your breath smelling sweet as it is rich in polyphenols, which are powerful antioxidants, can stop plaque from clinging to your teeth. Plaque build-up causes bad breath among another dental problem. Polyphenols inhibit the development of bacteria in the mouth, thereby reducing the foul-smelling substances that develop bacteria. 13. Cloves: You can use cloves to make natural mouthwash. When you steep them in warm water, you will have an excellent antibacterial mouthwash, which kills germs inside the mouth successfully. Cloves have a powerful antioxidant known as eugenol and it has great anti-inflammatory abilities. Cloves will also help prevent inflammation and infection. 14. Foods rich in zinc: Zinc is a mineral known for its antimicrobial properties. Additionally, zinc is great for the immune system and against infection. It will neutralize and get rid of harmful bacteria. Foods rich in zinc like pumpkin, cacao and organ meet, will definitely help to prevent bad breath. 15. Visit your dentist regularly: Visit your dentist at least once a year as dental visit is an important requirement to maintain a good dental health. If possible, visit your dentist twice a year to get through cleaning and to make sure you do not have any underlying problems that may cause rampant bad breath. Nancy Shevell is the author of the article writes for J B Dentistry, an expert dental service provider in Diamond Bar, California. If you would like to write for HealthResource4u, check our guest submission guidelines.